Join the discussion on our forums! Come discuss Mimic Pod over in our dedicated Mimic Pod discussion topic. Half a cup of Thistle Tea. And it seem like that is the rig tdose, because that card never saw play and this one is at least an one of in most decks. Miracle rogue card. Preparation pull and synergy. Thank you blizzard for another great miracle rogue card. In miracle rogue, you want to fill your hand with cheap spells to get a massive vancleef or questing adventurer out. This will draw you a card and you get 2 copies of it. Therefore this is an oppertunity to get a third prep, a third fan of knives, a third auctioneer, a second vancleef, ect. And in the lategame... If you have an auctioneer out this will draw three cards. That is insanely strong for miracle rogue, and i expect it to be run if miracle rogue isn't completely dead without conceal. This card is 66.6% of Thistle Tea for 50% of it's cost. Seems good, running 2 copies in jade rogue looks much more suitable than 1 thistle tea, because double tea feels very bad and slow. More importantly you can now play 6/6 edwin on turn 3 if using prep with it. I think this card is very good actualy. Attack of the Body Snatchers? But other than that, yes, right on spot! Upvoted. Thistle Tea gives you three cards for six mana. It's like Nourish, which also gives three cards, but for five mana. The difference between five mana and six mana for a card that begs you to use an entire turn to play it is a big deal. Nourish sees play in only slow decks, and Thistle Tea sees play nowhere. 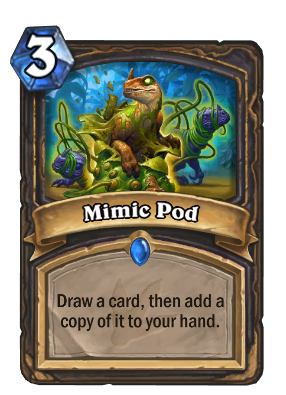 Mimic Pod gives you two cards for three mana. It's like Arcane Intellect, and both cards have equal cost. Both cards have synergy potential with their class (mage because it's a spell and rogue because it helps you activate combo). Arcane Intellect is auto-include in every mage deck. I predict that this card will prove to be a staple in rogue decks. Drawing efficiently is an essential part of the "save up cards and play them all at once" playstyle Blizzard has wanted for Rogue since the beginning, and I think this card will help move rogue in a healthy, fun, and usable direction. I'm greatly excited by this reveal. Little bit of Thistle Tea, little bit of Chromaggus and voila! You got yourself a nice Mimic Pod! Wasn't Thistle Tea just a little bit of Chromaggus and Nourish before? Actually mill is extremely strong and destroys anything from freeze to control, even midrange is pretty powerless against it if you draw well enough with only aggro being able to hopefully challenge it, well that aside you say it has to be for a specific card and while it can work in theorycraft decks it can work fine in any more unique control decks as having a good number of good cards will mean you might double up something quite nice without needing it to be exactly this or that card, ya also have to take into account that mage has a 3 mana draw 2 cards and uses it very often in tempo rarely getting the discount from apprentices and still has no problem with its cost. I personally have been playing a tempo mage to try and contest aggro decks for a while now and it seems to work quite well and a 3 mana draw 2 cards has never actually hurt my tempo, so this cheaper and weaker thistle tea will definitely up both tempo and control decks all while helping them with card generation that doesn't stress their deck. A rouge version of Arcane intellect. I think it's kind of more grey, honestly. When rogue gonna get some great card ? its impossibru! Two thirds of a Thistle Tea at half the cost. Definitely something I'd consider playing, though I'm not sure it's all that great. Isn't it technically half a Thistle Tea since you only get one copy (and that's the major effect on display)? You would be correct, as Thistle Tea adds 2 copies and this card adds 1. It depends on how highly you value the card duplication effect vs the raw card advantage. If you're using it just to duplicate cards then it's 1/2, but if you're using it just for the card advantage it's 2/3. Generally though, the draw RNG effect will make it difficult to justify relying on this card for card duplication. As such, it will almost always be used exclusively for the card advantage.